Buff away aging skin cells, unclog your pores and polish your skin with this full body exfoliation treatment, using a mixture of abrasive Dead Sea salts and soothing oils. Finish with a light, soothing massage. Less abrasive than the salt scrub, this gentle full body exfoliation leaves your skin soft, supple and hydrated. Finish with a light, soothing massage. This hydrating wrap promotes circulation, reduces inflammation, tones and improves skin elasticity. 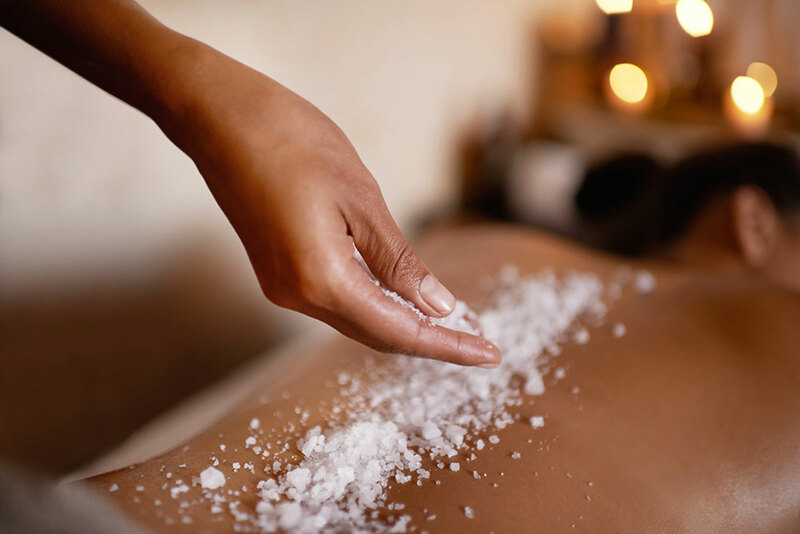 It also stimulates the immune system, promotes muscular relaxation, relieves pain and supports detoxification. Start with an invigorating salt scrub combined with lemon, maple syrup and cayenne pepper to polish the skin. Then relax with gentle heat while wrapped up tightly so the detoxifying properties can penetrate the body. Finish with a soothing application of lemon flower massage whip. Achieve that sun-kissed San Diego tan without the harmful UV rays. The therapist will apply the color evenly and streak-free. Please shower and exfoliate before coming in for best results. Skin should be clean and free of any residue. It is recommended to wear loose clothing and sandals. Add an exfoliation treatment for an additional $45.